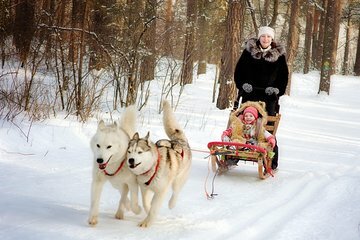 Combine historical sightseeing with snowy adventure on a private, 6-hour wintertime Peterhof Palace and dog sledding experience from St Petersburg. The trip starts with a visit to the Peterhof, a palace and garden complex commissioned by Peter the Great and dubbed the ‘Russian Versailles.’ Admire the gilded interiors on a guided tour and stroll through the fountain-studded Lower Park gardens. Continue to an Alaskan malamute dog farm and enjoy a thrilling malamute-pulled sled ride through the snow, along with a souvenir photo shoot with these beautiful, hardy dogs.